The I Roll with spicy tuna, crab, lettuce, cilantro, avocado and cucumber is just one of the items on Buoys' diverse menu. The first things that you notice when you enter Buoys on the Boulevard are the vibrant, eye-catching colors of blue, lime and coral creating a laid back, relaxed decor. Hidden in plain view on Ocean Boulevard in North Myrtle Beach is the newest grill, bar and sushi hotspot on the beach. Located in the center of the shag capital of the free world, Buoys has quickly become a favorite for residents of the North Strand. Combining the Caribbean influence of Chef Rio with the farm roots of owner Weldon Boyd has produced a diverse menu of classic favorites made from time-tested family recipes. 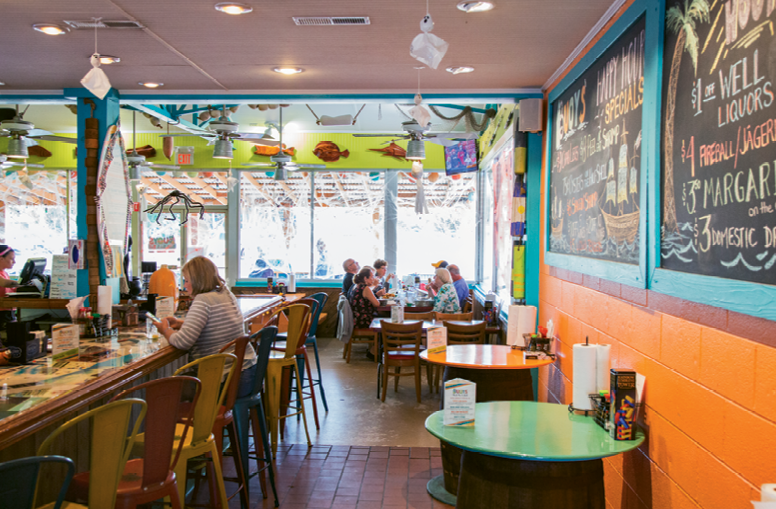 One look at the menu and you’ll realize this casual beachfront eatery is so much more than fish tacos and frozen coconut/rum concoctions. The choices range from sushi to south of the border to a Southern Style Low Country Boil. An excellent way to start is with a sushi teaser called the I Roll ($7). Spicy tuna, crab, lettuce, cilantro, avocado and cucumber are wrapped in rice paper and served with a house sweet chili dipping sauce, which will activate the taste buds of any foodie. The burgers are anything but routine. Starting with Angus beef and a house seasoning, the patty also contains rib eye, filet mignon and brisket to give it a flavor that requires no condiments. It is served on a fresh brioche roll with thick, tavern-style fries and homemade coleslaw that is not too sweet and contains a hint of broccoli. The pickled okra on the side is a nice touch ($10). Granny’s Crab Cake ($12) is a well-deserved favorite on the menu. “This recipe goes back three generations” says Weldon. Generous amounts of blue crabmeat are perfectly seasoned (using a minimum of filler) and pan-seared. The cake is then topped with lettuce, tomato and a remoulade sauce that complements the crabmeat without overpowering it. The brioche roll is toasted and the plate is also garnished with pickled okra. All seafood is local, if possible, and never farm-raised. A winning platter is the Fish On! Seafood Trio ($20). Tender shrimp, fresh flounder and plump, juicy oysters are lightly battered and fried to a golden brown. Buoys has live entertainment every Friday, Saturday and Sunday.